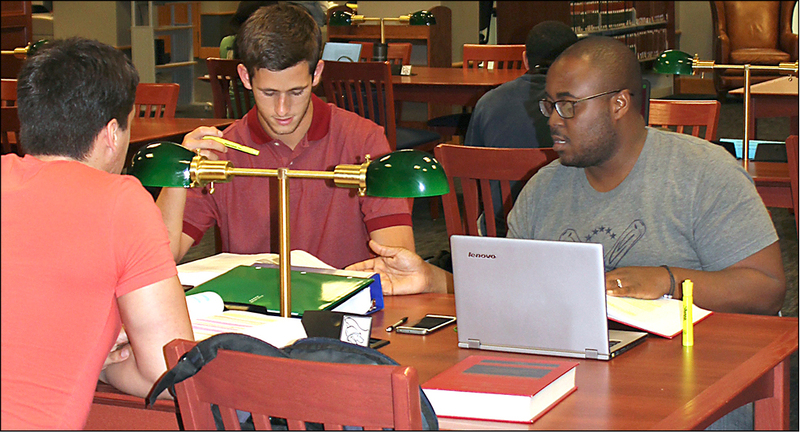 The start of a new school year at Oklahoma City University brings new environments for students of law and religion. It’s the first full academic year for the law school’s new location: a historic downtown building at 800 N. Harvey Ave. Meanwhile, work is continuing on the OCU campus to convert former law school library space in the Gold Star Building into classrooms and office space for the Wimberly School of Religion. Both buildings are considered Oklahoma City landmarks. The tower of the 286-foot tall Gold Star Building on the OCU campus, topped with a 200-pound star, can be seen for miles. OCU gives 1953 as the completion date for the building, although the floors in its tower were never finished. The Gold Star Building originally was intended as a home for the School of Religion, but wasn’t used as such until now, said Sharon Betsworth, the school’s director. It also now houses OCU’s theater and honors programs. The building was constructed in honor of Oklahoma Methodist veterans who died in World War II and the Korean War. Their names appear on a plaque in the lobby. Previously the School of Religion was housed in limited space at Smith Chapel. Now, "all of us have space to expand and grow," Dr. Betsworth said. Betsworth believes the new environment will be appealing to prospective students, with its plentiful light and open spaces. The school will have four classrooms by the time the work is done next summer, she said. The Gold Star Building is to be rededicated at next year’s United Methodist Annual Conference, Betsworth said. In turn, the School of Religion’s move out of Smith Chapel has freed up space for OCU’s Wesley Center, said Charles Neff, OCU’s vice president of university-church relations and dean of the chapel. Most of the chapel’s main floor, which includes the sanctuary, is used by Saint Paul School of Theology. The lower floor will be used by the Wesley campus ministry, and space will be available for student groups and interns, Rev. Dr. Neff said. Part of the lower lobby may be converted into a prayer station, he said. Downtown, the former Central High School building dates back to 1910. It also has served as offices for Southwestern Bell Telephone Co. and American Farmers & Ranchers Insurance. "Admissions are up," said Laurie Jones, associate dean for Law Admissions. She said that’s due to "the great reputation of the university and the wonderful facility." Visitors to that building can view memorabilia from the old high school in a room that also contains a two-part mural drawn by artist Olinka B. Hrdy in 1929. She didn’t sign the mural (whose sections are called "Development of the Mind" and "Development of the Body") until 1982. The insurance company left behind a system of rolling shelves that has proven ideal for OCU’s collection of law books, said Brook Arbeitman, the law school’s director of marketing and communications. The law school also features a Grand Hall, repurposed from what was the high school auditorium. It contains tables and chairs where students can study. Furniture can be moved to accommodate rows of chairs for larger events, Arbeitman said. Another feature is a classroom set up like a courtroom. There also are spaces for the Murrah Center for Homeland Security Law and Policy, Oklahoma Lawyers for Children, and the Oklahoma Innocence Project. This year, the law school has 453 students; 161 of those are first-year law students. The faculty numbers 29. Officials for both the religion and law schools have noticed an increase in visits by prospective students since their moves. 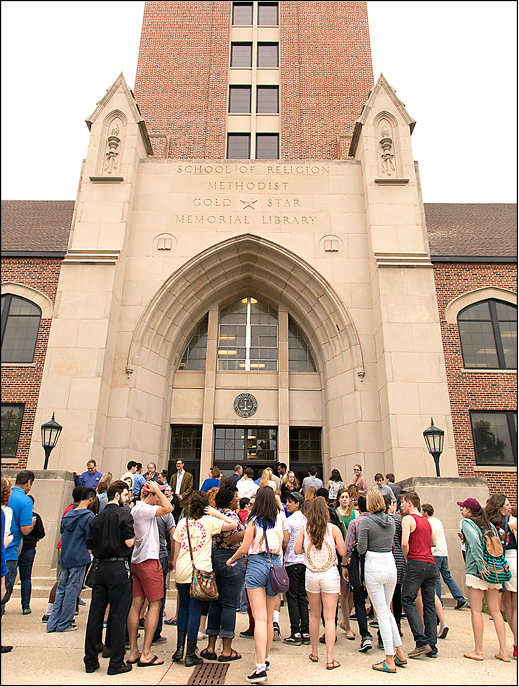 Students gather Aug. 23 for a celebration at OCU’s Gold Star Building. 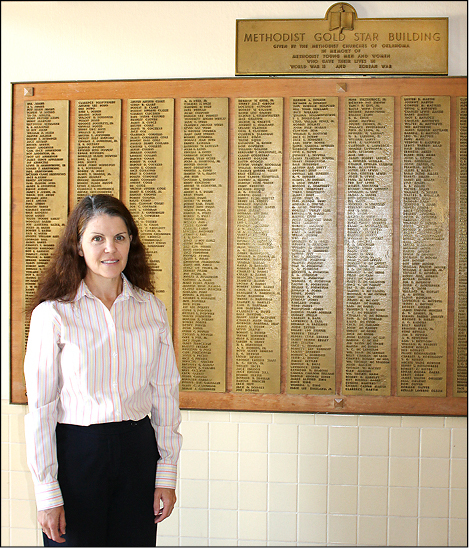 In OCU’s Gold Star Building, Sharon Betsworth stands beside a plaque that memorializes young Oklahoma Methodists who gave their lives in World War II and the Korean War. Beginning with this fall semester, the Gold Star Building now houses OCU’s Wimberly School of Religion.